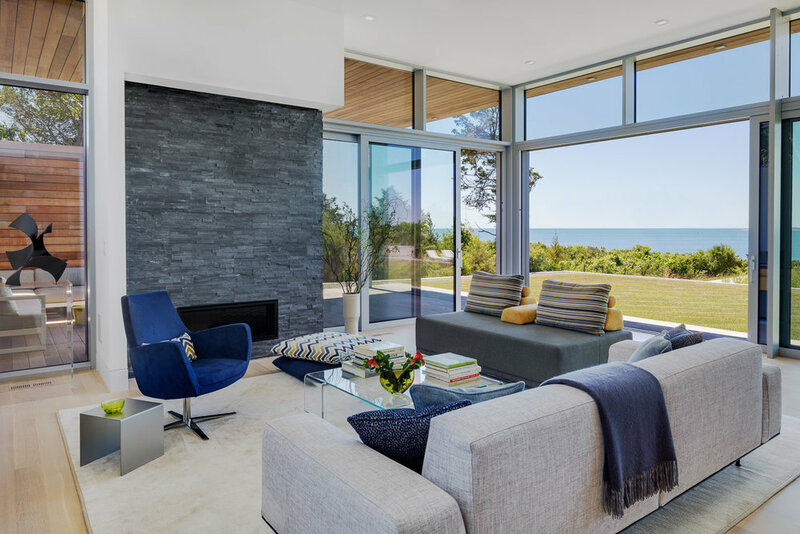 This modern ocean home achieves style, comfort, and aging in place within a challenging coastal New England setting. GOALS. After selling their property in a Boston suburb, the homeowners commissioned this retreat in South Dartmouth and procured an apartment in downtown Boston to match their new lifestyle as empty nesters. 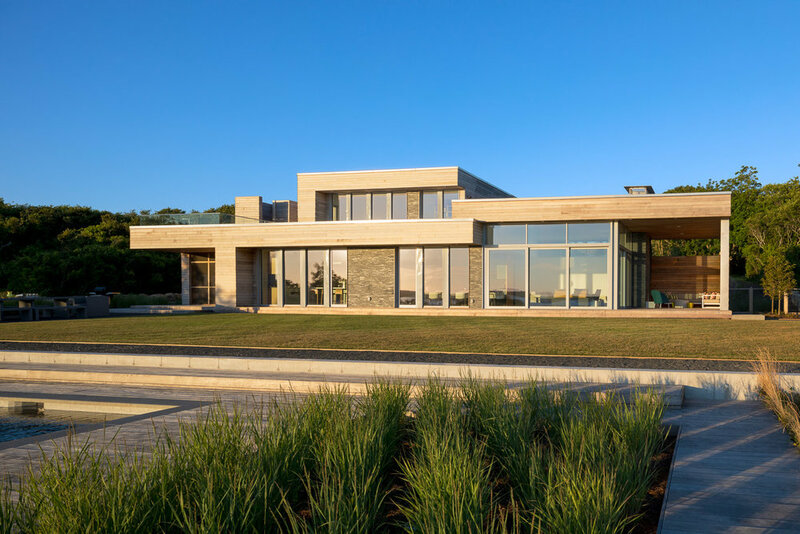 They were drawn to the site for its stunning water views and its proximity to both Boston and boating, and wanted a home that took advantage of the site, allowed for aging in place, accommodated entertaining, and provided comfortable, low-carbon living. EMBRACE THE SITE. The modern home hugs the land’s natural topography with a massing that steps down the sloping site to connect the primary living space directly to the site. PRIVACY. The street-side approach to the home is reserved and private. From the auto court, a flight of stairs leads down to the front entrance next to the garage, with wood clad doors concealed within the siding, acting as a gateway to the site. The water view peaks through the transom window, but hides behind an oak clad art wall across from the entry door. Once a guest is invited in however, the stunning ocean view is revealed. It is integral to the living spaces with a generously glazed western façade capturing magnificent sunsets. LIVING WITH ART. 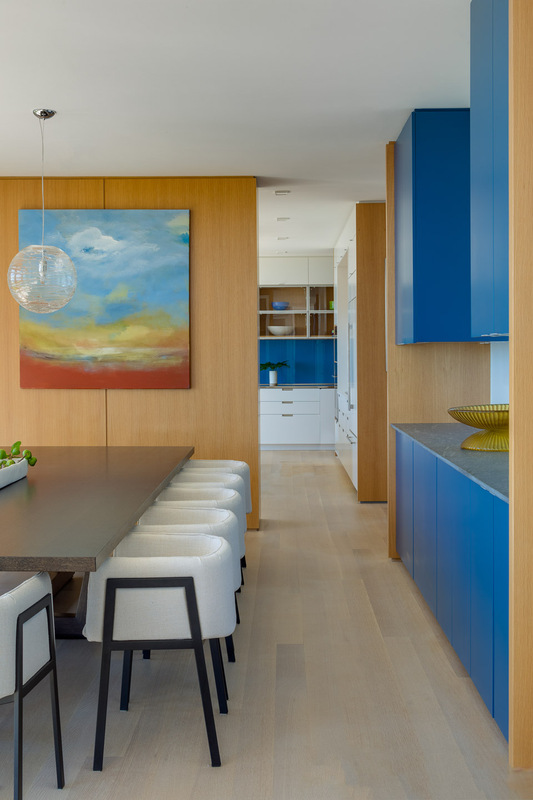 Plastered and white oak clad walls, paired with lighting, were designed throughout the living space to display the client’s extensive art collection. The oak walls serve the dual purpose of creating privacy at the entry door and partially enclosing the kitchen to provide more separation between the kitchen and the dining + living areas than a traditional open concept layout. LIVE OUTDOORS. The indoor living space is flanked by covered outdoor spaces on either side. A covered outdoor living area with a wood-burning fireplace opens off of the indoor living space for seamless indoor-outdoor living. The programmed space extends outside with a lawn and a pool beyond. The kitchen gives way to the eating areas on the screen porch and patio. In addition to commanding ocean views, the master suite incorporates a private roof deck with an outdoor shower, located above the screen porch. AGING IN PLACE. The new home allows the homeowners to stay as long as they desire. Accessible features include an elevator to connect the three floors of the home, a threshold-free shower in the master suite, and amply sized passageways. LIVE COMFORTABLY. Consistent temperatures help create thermal comfort, regardless of New England outdoor conditions. The right-sized HVAC systems operate mostly unnoticeable - as they should. Artfully concealed exterior shades block the west-facing afternoon sun to ensure optimal thermal comfort year round. LIVE EFFICIENTLY. The combination of the super-insulated airtight enclosure and well-designed mechanical systems create a house with exceptionally low energy consumption. NET ZERO ENERGY. The photovoltaic system on the roof produces almost enough energy annually to offset the home's consumption, making it near 'net zero’ energy. Charging ports in the garage allow the owners to charge their electric car utilizing the electricity produced by the photovoltaic system. RESILIENCY. The home's super-insulated envelope means if a power outage occurs during a winter storm, heat loss will be slow - taking days to drop to 60 degrees even with no heat source. A backup generator supplies electricity during power outages. OVERALL. The combination of the stunning location, exceptional comfort, low operational carbon footprint, and the practicality of being able to age in place created the homeowner’s 'forever home’.